Weekly Photo Challenge: Cover Art | Oh, the Places We See . . . It wasn’t until the masses of balloons had ascended on Saturday, October 11th that we noticed a late comer — a truck bearing a basket and balloon. Out jumped a lady and her entourage who began puffing up a colorful yellow/red/blue balloon with giant fans. But they were late. Noticeably late. After almost all balloons that were going to lift off had already done so. But, as we found out later, she never intended to launch a balloon. Just wanted to inflate it only to take it down a few minutes later. To give the crowd a chance to watch the workings of a balloon launch — from start to almost-finished, just before take-off. She even answered questions and chatted with those of us pointing cameras at the crew intent on filling the space with hot air and then checking for whatever they check for prior to launch. It was then that the idea for a book came to mind: What would it take to go from ground to air? And then we found two photos that could serve as cover art for this inside look. 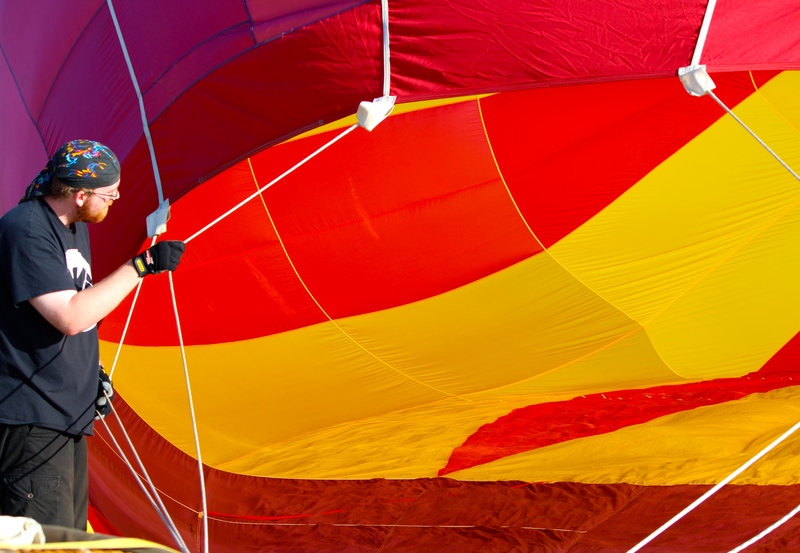 Holding on as hot air fills a balloon at Balloon Fiesta 2014. So, what do you think? Which one do you prefer? Or do you have another thought about what would be great cover art for a glimpse into the fascinating craft of ballooning? Be sure to check out the other entries in Weekly Photo Challenge: Cover Art by clicking here. This entry was posted in Festivals, New Mexico, Photography, Weekly Photo Challenge and tagged Albuquerque, Balloon Fiesta 2014, cover art, hot air balloon, postaday, Weekly Photo Challenge. Bookmark the permalink. Thanks! I am going to be posting a series of posts on the Balloon Fiesta 2014 beginning next week, I hope. I get the ideas for photo challenges from The Daily Post. They come from the WordPress folks each Friday. Hope you can link up to them. It’s fascinating to see what everyone submits. I love that fire picture, too! Hadn’t thought of that, but it’s definitely shooting up inside the balloon. Great idea! Very cool cover art, Rusha! Can’t imagine the real size of it…. Thanks, Amy. The balloons are enormous. 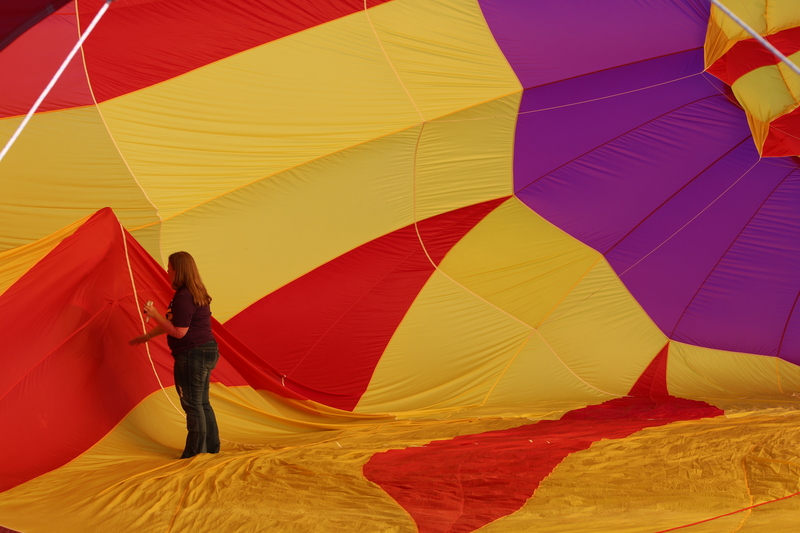 Balloonists lay them out on a huge portion of the field and ask that the crowd move away while they are unrolling. It’s a production, for sure! Thanks for the comment. I didn’t even know about tension in photography. Learning from you!!! I like the first shot, with the woman in it. It shows the scale of the balloon and also leaves a lot of room for text. Great ideas for that choice! It was really interesting to watch her inspect the inside. Not sure what she was noting or repairing, but it was interesting nonetheless. Appreciate your opinion!! !